Telugu cuisine is a cuisine of South India native to the Telugu people from the states of Andhra Pradesh and Telangana. Generally known for its tangy, hot and spicy taste, the cooking is very diverse due to the vast spread of the people and varied topological regions. Andhra Pradesh state is the leading producer of red chili, rice and Telangana state is millets in India influences the liberal use of spices — making the food one of the richest and spiciest in the world. Vegetarian, as well as meat and seafood (coastal areas), feature prominently on the menus. Pappu, tomato, gongura, and tamarind are largely used for cooking curries. Spicy and hot varieties of pickles form an important part of Telugu cuisine. There are many regional variations due to topographic differences in Telugu-speaking populations spread over a large area. They can be classified based by region into Coastal Andhra, Rayalaseema, Telangana cuisine. Cultural factors that have heavily influenced the cuisine over the years are the eating habits of the Hindu royal, Brahmin, and the Muslim Nawabi royal families. Andhra Pradesh and Telangana states proximity with Western, Central and Eastern India makes those border regions' cuisine more diverse with Telugu population spread into neighboring states. Different communities have their own variations and the rural areas still follow the centuries-old cooking habits and recipes. The Coastal Andhra region is dominated by Krishna and Godavari delta regions and is exposed to the long coastline of Bay of Bengal. Hence rice, dal, and seafood are the staple diet of the people. This region has its own variations, but ultimately the dishes are predominantly rice-based. This region is one of the largest producers of rice and chilies. Nellore region in the southern part of the region has its own unique recipes, which are markedly different from those in the Uttarandhra region. Ulava charu is a famous soup made from horse gram; Bommidala Pulusu is a fish stew that is a specialty of Andhra Pradesh. Andhra cuisine is more dominant in restaurants all over Andhra Pradesh as well as Andhra restaurants in cities like Bangalore, Chennai and New Delhi. Most restaurants in Andhra Pradesh have food of nearly same quality. Uttarandhra region is the northeastern districts of Srikakulam, Vizianagaram and Visakhapatnam bordering Orissa state in Coastal Andhra. While Visakhapatnam district has its own distinct Dialect and Cuisine which is closer to the rest of Andhra, Vizianagaram and Srikakulam have a slight difference in taste compared to rest of Andhra. The cuisine of this area has its own distinctive flavors and unique taste, while it shares many similarities with Andhra region cuisine. The people of this region like to eat many of their foods sweeter than other regions of Andhra Pradesh. They often cook lentils in jaggery (referred to as Bellam Pappu) enjoyed with butter and steamed rice. They cook vegetables in gravies of menthipettina kura (fenugreek seed paste), avapettina kura (mustard seed paste), nuvvugunda kura (sesame paste), etc. Ullikaram is another popular dish where vegetables or corn seeds are flavored in shallots or onion paste. Poori and Patoli is a favorite breakfast or festive dish. Patoli is soaked split black chickpeas (Senagapappu or chana dal) ground to a coarse paste and seasoned in coriander seeds, onions and, at times, with cluster beans (Goruchikkudu kaya). Uppupindi is coarsely broken rice Upma steamed with vegetables and tempering seeds. This dish is had during festive days when people fast during the day and have it at night. Attu which is also called Dosa is standard breakfast in Andhra Pradesh which is served with Coconut or tomato chutneys. Idli is also very common in homes. Inguva Charu is a sour-and-sweet stew made with tamarind and hing. It can be had with rice or Uppupindi. Bellam Pulusu is another highly flavored thick sweet stew made out of rice flour, jaggery (cane sugar), corn cobs and whole shallots. The pickles vary from other regions of Andhra Pradesh.Avakaya is mango pickle which is part of a standard Andhra meal.They sun dry mango pieces with mustard powder, red pepper powder and salt soaked in sesame oil to give the pickle extended shelf life. The result is a darker hue and sweeter taste. This method is followed to withstand high moisture from the Bay of Bengal coast. Karappoddi, popular curry powder that is served with Idly, Dosa and Upma. Rayalaseema, the southern region of Andhra Pradesh, has some unique dishes in its cuisine. Rayalaseema cuisine is famous for being spicy because of the liberal use of chilli powder in almost all the dishes. Seema karam is unique to its dishes. There are different foods and snacks made in the Rayalaseema region. Some of the main courses include rice, jonna (jowar), ragi roti with a combination of neyyi as well as Raagi Sangati, usually served with spinach or Pulusu. Uggani is a dish unique to Rayalaseema region especially Ananthapur, Kurnool and Kadapa districts and Karnataka where it is called as Oggane .It is made by boiled Paddycorn and is generally yellowish in color due to liberal usage of turmeric powder and is usually served with mirapakaya bajji (chili bajji) Uggani Bajji is served primarily as breakfast but generally eaten as a snack food too. It is spicy and is one of the ethnic and authentic dishes of Rayalaseema and Eastern Karnataka. Attirasaalu or Attirasa (rice-based vada using jaggery), pakam undalu, (a mixture of steamed rice flour, ground nuts, jaggery), Borugu Undalu (a sweet variety made corn of jowar and jaggery) and rava laddu are the sweet specialities. Masala borugulu or Nargis Mandakki (like snacks), ponganaalu wet rice flour, fry with oil, carrot, onions, chilis are other savory specialties. The Telangana state lies on the Deccan plateau and its topography dictates more millet and roti (unleavened bread) based dishes. Jowar and Bajra features more prominently in their cuisine. Due to its proximity with Maharashtra, Chhattisgarh and northwest Karnataka, it shares some similarities of the Deccan plateau cuisine. Telangana in its cuisine, there is special place for roti's made from millets, such as jonna rotte (sorghum), sajja rotte (penisetum), or Sarva Pindi" and Uppudi Pindi (broken rice). In Telangana a gravy or curry is called Koora and Pulusu (Sour) in based on Tamarind. A deep fry reduction of the same is called Vepudu. Kodi pulusu and Mamsam (meat) vepudu are popular dishes in meat. Vankaya (Brinjal) koora or Gutthi Vankaya, Aloogadda (Potato) koora & fry, Bendakaya (Okra) pulusu & fry are one of the many varieties of vegetable dishes. Palakoora pappu is a spinach dish cooked with lentils eaten with steamed rice and rotis. Peanuts are added as special attraction and in Karimnagar District, cashew nuts are added. Popular Telangana curry dishes (known as Koora) include Boti, derived from mutton and Thunti Koora made out of Red Sorrel leaves. Potlakaya pulusu, or Snake gourd stew is one of the daily staple dish. Sakinalu & Garelu are the most popular fries/fritters made of rice flour during festivals like Dusshera and Sankranthi, making them very delicious and one of its kind fries of South India. Sarva pindi, a spicy pancake, is a staple breakfast, made with rice flour, chana dal, ginger, garlic, sesame seeds, curry leaves and green chiles. Puntikura Chana Dal: A vegetarian alternative to 'Gongura Ghosht', chana dal is cooked in spices and tempered with mustard and curry leaves. Bachali Kura: A tangy spinach curry cooked with tamarind paste. Pachi Pulusu: A spicy, raw rasam made with tamarind, chili and onions. Prepared mainly in Summer. Rail Palaram is a traditional food inherited from forefathers which is made from rice flour. Steamed rice flour balls are stir fried with soaked chana dal, curry leaves, green chillies, onion and grated fresh coconut. Passham (sweet) - done in 2 ways; one with jaggery and milk and the other with talukalu prepared of dough. Challa Charu - A dish prepared by tempering buttermilk. Guddalu - prepared with different beans, Blackeye beans, corns, Chana, Sprouts along with some spice and onion. Garje - a sweet filled with a combination of either sugar or jaggery, with lentils. Rotu Tokkulu - are famous again - generally, they are prepared by semi fry the vegetables and grind it on a stone grinder tools, or in a mixer with adding thadka to it. Ooru Kodi Pulusu: Telangana’s special flavorful country chicken curry. Snacks & Savories Sugar madugulu is a sweet made with milk and butter with sugar coating, and pharda pheni' is another sugar-coated crispy wafer sweet. Recent years has seen a resurgence of Telangana cuisines in restaurants around Hyderabad with the availability of Telangana thali dish for lunch. Idli: Urad dal and rice steamed dumplings, often eaten with freshly made chutney or with neyyi added and sprinkled with karrap podi (chili dal powder) or chutney and sambar. Andhra Dosa: A rice- and urad dal-based pancake or crepe eaten with condiments like Chutney and Sambar. Minapattu a.k.a. Dosa: Rice and Lentil based Pancake or Crepe fried in flat pan laced with cooking oil, accompanied with Chutney and Sambar. Pesarattu: A Moong Dal-based Pancake or Crepe fried in flat pan laced with cooking oil. It is usually served with ginger chutney. Sometimes Pesarattu is filled with Upma, known as Upma Pesarattu. Dibba Attu (Idli batter based Dosa): Idli batter poured into a thick and deep frying dish and fried until the outer layers become crispy and brown. Atukula dosa : Dosa made from Atukulu a.k.a. Poha. Rava dosa: Dosa made with Sooji dough with Chili, Coriander leaves, Onion and Pepper. Godhuma Uppindi: Upma made from Broken wheat flour. Uppudu Pindi or Uppindi a.k.a. Upma: Upma made from broken Sooji flour. Saggubiyyam (Sago) Upma: Uppma made from Sago (Saboodana). Semiya Upma (Vermicelli) Upma: Upma made with Vermicelli. Garelu (A type of Vada): Deep fried Lentil based Doughnut, or regular deep fried Dal mixture. Punukulu or Punugulu: Bonda, a deep-fried dish made from Idli/Dosa batter. Gunta Punugulu: Made from Rice and Dal batter fried in half sphere-shaped pan. Saggubiyyam Punugulu: Vada made from Sago (Saboodana). Mong Dal Punugulu: Bonda, a deep-fried dish made from Idli/Dosa batter. Thapala Chekkalu: A Deep-fried Rice and Dal based flat Vada added with onions, curry leaves and chili. Atukulu: Also known a Poha in Northern states, Moist Rice flakes sautéed in little oil. Atukula dosa: Dosa made from Atukulu a.k.a. Poha. Atukula Upma: Upma made from Atukulu, just replacing atukulu with sooji. Nokulu annam: made of Jowar and jaggery. Chapatti: Flattened Wheat dough heated in a flat pan. Served with Dal or Chutney. Puri: Wheat dough deep fried in cooking oil. Served with Potato Bajji or Chutney. Though a North Indian dish, It is prepared on some occasions and widely available in all restaurants. Lunch and dinner are elaborate affairs in many Telugu households. In a majority of urban households, the food is served in stainless steel or porcelain plates, while in traditional and rural households, the food is served on a banana leaf. The banana leaf is used during festivals, special occasions and for guests. Many restaurants in middle-budget in smaller towns use banana leaves for serving. At times, Vistaraaku (a larger plate made of several leaves sewn together) is used. The traditional packing material for long journeys was sun-dried banana leaves. A complete vegetarian Andhra meal in restaurants and homes consists of rice served with ghee, pulihora, chapati or puri, pappu (lentils), sambar, chaaru (rasam), fried and wet curries, appadam (papadum), odiyalu, pachadi, avakaya, yoghurt and a sweet. Food in general contains more chilli and spice mix in the Vijayawada-Guntur region than the rest of Andhra Pradesh. For presentation, pappu (dal/lentils) and kooralu (curries) are placed to the right of the diner, while spiced pickles, Pachadi (chutney/Raita), a saucy condiment with dahi (yogurt) and vegetables and Pappulu Podi (Dal & Dry Red Chilli based powdered condiment) & Neyyi (Ghee) are placed to the left. On some occasions special items such as Pulihora (Tamarind rice/Lemon Rice) and Garelu (vada) are placed at the top right. A large scoop of Annam (plain white rice) is placed in the middle. Small amounts of Neyyi is added on rice, Aavakaaya Mango pickle and Gongura Roselle leaf pickle are two varieties of pickles which mark the spice and flavor of Andhra cuisine. Dibba rotti or Minapa rotti is a classic Andhra dish served as breakfast, brunch or evening snack with a good chutney or pickle. It is prepared with urad dal and rice rava batter. Annam is a staple of the entire meal and is typically mixed with the other course using the right hand. It is the main source of carbohydrates. Spiced pickles, pachadis, podis and papadum (appadam) are available as condiments. The order of a meal is to start with modhati muddha (first bite) with an appetizer of an ooragaaya (spiced pickle) followed by a Pappu, which can be made with vegetables added or eaten plain with a pickle. It is the main source of protein for vegetarians. This is followed by a couple of koora varieties (curry/main dishes) either only vegetarian or a combination of vegetarian and non-vegetarian for getting their vitamins and minerals. A pappu or rasam or a charu (usually kadi is the third part of the course. The fourth course of the meal is either a Perugu (Curd or Yogurt) or as Majjiga (Buttermilk) accompanied by a spicy pickle or any of the other condiments. After meal paan or somph, (Arcenut, Betel on Pan Leaf) is offered in traditional households. On a festival or auspicious occasions, a sweet which is usually paravannam is served with the meal, which is usually eaten first. Vepudu (Fry): crispy fried vegetables, typically including: okra (bendakaya), ivy gourd (dondakaya), potato (bangaladumpa), colocasia and several regional vegetables but prepared separately for different days. Pappu Koora (Lentil based dish): boiled vegetables stir-fried with a small amount of half-cooked lentils (dal). Podi (Powdered Dal based condiment or seasoning): Mixed with Rice and spoonful of ghee or sesame oil. Gujju (Gravy), Tomato or coriander seed base adding Drum Stick, Brinjal, Okra etc. Pulusu Koora/Aava petti Koora (Stew dish): boiled vegetables cooked in tamarind sauce and mustard paste are two main varieties of Pulusu. Kaaram Petti Koora/Koora Podi Koora (literally dish with curry powder added): sautéed vegetables cooked with curry powder or paste, served as a solid mass. The vegetables can be stuffed with curry powder or paste and are usually cooked whole. Ooragaya (Pickled), Avakaya, Gongura, Nimmakaya etc. Pachadi (Pasty/saucy condiment or Chutney): Kobbari (coconut), tomato , Gongura, Dosakaya, Gummadikaya, Allam (Ginger). Other gravy based curries are chiefly made with vegetables cooked in tomato sauce and onion with coriander and cumin powder. Pappu (Dal/Lentils) Toor Daal (Kandi Pappu) or Moong Daal (Pesara Pappu) cooked with a vegetable or green. No masala is added to the dal. Some regions include garlic and onion in the seasoning while some regions prefer asafetida (hing/Inguva). Kandi pappu is often cooked with leafy vegetables Palakura (spinach), Gongura, malabar spinach, and vegetables such as tomato, mango, Aanapakaya. Sometimes the cooked version of the dal is replaced with a roast and ground version of the dal like Kandi pachadi (roasted toor daal ground with red chiles) and pesara pachadi (soaked moong daal ground with red chilies or green chilies). A very popular Andhra combo is Mudda Pappu (plain toor dal cooked with salt) with Avakaya. Menthi Challa / Menthi Majjiga - Sour buttermilk seasoned with ginger / green chili paste and menthi seeds fried in oil. Perugu - The last item of the meal. Perugu (curd) is normally consumed with an accompaniment like pachadi or ooragaya. Pachadi and Ooragaya are two broad varieties of pickles that are used at times with rice. Pachadi is like a sauce typically made of vegetables/greens and roasted green/red chilies. It is prepared fresh and is consumed within a day or two due to a short shelf life. Ooragaya is prepared in massive amounts seasonally and uses liberal amounts of chili powder, methi (fenugreek) powder, mustard powder and groundnut(peanut) oil. For a typical Andhrite, no meal is complete without this essential item. It is consumed on its own mixed with rice or is also eaten as a side dish with Pappu/koora. Apart from a sizable population who are vegetarians, most of the population cook non-vegetarian dishes. The state has abundant seafood and has extensively established poultry industry. Lamb meat is another traditional fare cooked with century old recipes. Apart from Hyderabadi biriyani, the rest of the state has its own recipe and generally known as Palaav or Andhra Biriyani. Kodi (chicken) palav is one of the most enjoyed dishes across all of the state. Royyala palav made with shrimps is considered a delicacy in homes of coastal Andhra Pradesh. Mutton biriyani and Mixed Biryani(Chicken, Mutton, and Shrimp) are the other popular Biriyani dishes generally available in restaurants. 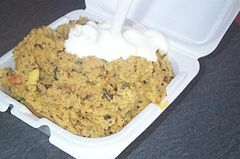 There are many local variations such as Kaaja Biryani, Kunda Biryani (pot Biryani). Kodi (Chicken) Koora and Mutton (Lamb) koora are two popular dishes, often made with a range of spices and condiments. The gravy base is usually Onions, Tomato, Coriander, Tamarind, and Coconut. These gravies are mixed with steamed rice on the plate during lunch. Also pepper is used for fried meat dishes. Popular dishes served commonly in Andhra-style restaurants include the spicy, Andhra Chilli Chicken, Chicken Roast, and Mutton Pepper Fry. Among seafood, Tamarind base is widely used. The state's large shrimp farming makes shrimp and prawns widely available. Andhra Restaurant chains and hotels are very popular in other states due to its extensive variety of meat in the menu. Talakaya Kura: A hearty, rustic meat gravy with bold flavours. This delicacy is made with the lamb's head, coriander and spices. Chepala Pulusu: A luscious fish curry redolent with freshly ground spices and tamarind juice. Endu Chepala Vankaya: A flavoursome dry fish gravy cooked with brinjal. Royyala Kura: Prawns cooked in a tangy paste of tamarind and onion. Gongura Mamsam: A spicy curry made with tender lamb pieces cooked in gravy of Gongura (roselle leaves) and freshly ground green chilli paste. Kodi Gudla Pulusu: Egg curry flecked with chopped onions, green chillies and bright bits of coriander. These curries are usually served with steamed Rice, Bagara khana (Basmati rice cooked with aromatics), ‘’Sajja’’ roti (Millet flatbread) or ‘’Jonna roti’’ (Jowar flatbread). Andhra cuisine has some native non-vegetarian snacks such as Kodi Pakodi (Chicken Pakora), chicken 65, Peetha Pakodi(Crab Pakodi), Chepa Vepudu (Fish Fry), Royyala Vepudu(Shrimp Fry) etc. Other snacks inspired from Indo-Chinese cuisine such as chicken 65, Chicken lollipop, Chilli Chicken etc. are also extensively available but they will be generally modified by using generous amounts of Spices and chillies. Bhimavaram town in West Godavari District is very famous for its unique Non-Veg pickles such as Chicken Pickle, Shrimp Pickle, and Fish pickles. The agency(forest) area near Rajamundry is very famous for Bongu chicken (Bamboo chicken) curry. Ravva Dosa served at a Hotel in Guntur. Varieties and variants: Mirapakaya Bajji (Chilli) popular evening snack all across the state, Vamu Bajji, Vankaya Bajji (Brinjal), Aratikaya Bajji (Plantain), Urla Gadda Bajji (Potatoe), Vegetable Bonda. Gaare - గారె Gaares are a deep fried and spiced dough. Maramaraalu or Popped Rice - Usually mixed with tomatoes, onions, coriander and lime juice and chilli powder. Bean/Pea Snacks includes Senagala Talimpu, Guggillu - గుగ్గిళ్ళు etc. Sweets and savories form an important part of Telugu culture. Made on festive and auspicious occasions, they are given to visiting relatives. Some of the savories are also made for the evening snack. Pootharekulu - a famous sweet preparation where sweet powder with cardamom flavor is stuffed into very thin pancake skins made of rice flour. Kajja Variations of this sweet preparation i.e., Madatha kajja and Kakinada Kajja are relished across the state. Sakinalu is one of the most popular savories, it is often cooked during Makara Sankranti festival season. This a deep-fried snack made of rice flour, sesame seeds and flavored with ajwain (carom seeds or Vaamu in Telugu). Kajji Kai is a fried dumpling with the stuffing of suji, dry coconut powder, and sugar. It is usually prepared during Deepavali. Sunnundalu - Laddu made from with roasted Urad Dal (Minapappu) and Jaggery (Bellam)/ Sugar a generous amount of ghee is added to enhance to the taste. Poornam Boorelu a.k.a. Poornalu - Chenna dal is cooked to soft and cooled, jaggery and cardamom powder are added and the mix is rolled into balls. These balls are then batter fried. The batter that is used is made from Urad Dal. This sweet preparation is usually served during festive lunch. Pulagam a.k.a. Pongali - A sweet preparation made on a festive morning as offering for the deity. Soaked rice is cooked in a generous amount of milk usually in the ratio of 1: 2.5 when the rice is cooked well-broken jaggery is added and finished with a splash of ghee and fried dry fruits. Malai Khaja - Traditional Nellore Sweet. In rural Andhra Pradesh, agriculture is the predominant occupation. Some centuries-old cooking practices, especially the use of mud pots, are still in vogue but are being replaced by steel utensils in recent decades. The earlier recipes in each village were also largely dictated by what was grown and available locally. In the drier districts, jowar (sorghum), bajra (millet) and ragi are still in use, while eating rice is seen as a symbol of prosperity. In Delta and coastal districts, rice takes a major role in cooking. ^ "The Telangana Table". LESLEY A. ESTEVES. Outlook Traveller. 1 June 2012. Archived from the original on 25 February 2014. Retrieved 22 February 2014. ^ Rice Bowl: Vegetarian Rice Recipes from India and the World. ^ "Bongulo Chicken at Kolluru Huts". Ratnakar Patrayudu. The Backpack Diaries. 16 Aug 2018. ^ "Kajjikayalu – Traditional Andhra Sweet". Sailu's Kitchen. 1 June 2006.